"It's very likely that things like seasonal affective disorder involve this pathway," says Jerome Sanes, a professor of neuroscience at Brown University. Sanes was part of a team that found evidence of the brain circuit in people. The scientists presented their research in November at the Society for Neuroscience meeting. The work hasn't been published in a peer-reviewed journal yet, but the researchers plan to submit it. "Now you have a circuit that you know your eye is influencing your brain to affect mood," says Samer Hattar, an author of the mouse study and chief of the section on light and circadian rhythms at the National Institute of Mental Health. The finding is the result of a decades-long effort to understand the elusive link between light and mood. "It is the last piece of the puzzle," Hattar says. The research effort began in the early 2000s, when Hattar and David Berson, a professor of neuroscience at Brown University, were studying cells in the retina. 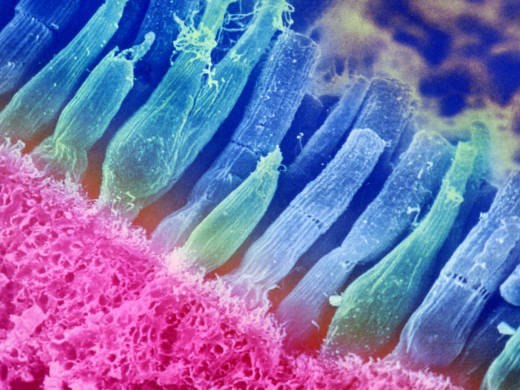 At the time, most scientists thought that when light struck the retina, only two kinds of cells responded: rods and cones. But Hattar and Berson thought there were other light-sensitive cells that hadn't been identified. "People used to laugh at us if we say there are other photoreceptors distinct from rods and cones in the retina," Hattar says. The skeptics stopped laughing when the team discovered a third kind of photoreceptor that contained a light-sensitive substance called melanopsin not found in rods and cones. (The full name of these cells, if you're interested, is intrinsically photosensitive retinal ganglion cells, or ipRGCs.) These receptors responded to light but weren't part of the visual system. Instead, their most obvious function was keeping the brain's internal clock in sync with changes in daylight. And many scientists assumed that this circadian function also explained seasonal depression. "People thought that the only reason you get mood problems is because your clock is misaligned," Hattar says. Other potential explanations included speculation that reduced sunlight was triggering depression by changing levels of serotonin, which can affect mood, or melatonin, which plays a role in sleep patterns and mood. But the evidence for either of these possibilities has been weak. Hattar and Berson were pretty sure there was a better reason. And, after years of searching, they found one. In September, Hattar's team published a study about mice suggesting a direct pathway between the third kind of photoreceptor in the retina and brain areas that affect mood. When these cells were present, an artificially shortened cycle of light and dark caused a version of depression in a mouse. But when the team removed the cells with gene-editing tools, the mouse didn't become depressed. Sanes knew about the research, in part because he and Berson are neuroscientists at Brown. And he was so intrigued by the discovery of the new pathway between retina and brain in mice that he decided to see whether something similar was going on in human brains. Sanes' team put young adults in an MRI machine and measured their brain activity as they were exposed to different levels of light. This allowed the team to identify brain areas that seemed to be receiving signals from the photoreceptors Hattar and Berson had discovered. Two of these areas were in the front of the brain. "It's interesting because these areas seem to be the areas that have been shown in many studies to be involved in depression and other affective disorders," Sanes says. The areas also appeared to be part of the same circuit found in mice. The finding needs to be confirmed. But Hattar is pretty confident that this circuit explains the link between light exposure and mood. So now he's trying to answer a new question: Why would evolution produce a brain that works this way? "You will understand why you would need light to see," he says, "but why do you need light to make you happy?" Hattar hopes to find out. In the meantime, he has some advice for people who are feeling low: "Try to take your lunch outside. That will help you adjust your mood."